SIGLENT once again exhibited at this year’s Design Con show in Santa Clara, CA, JAN 31 – FEB 2. 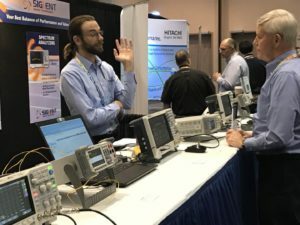 Vice president Zane Zhao and engineers from the North American team of SIGLENT showed a number of new products and technologies, including the newly released SDG6000X series pulse/arbitrary waveform generator, the SDS1204X-E low-cost four channel series super phosphor oscilloscope and more. The SDS1000X-E Super Phosphor Oscilloscopes feature two channel and four channel models. The four channel version is available in 100 and 200 MHz models and incorporates two 1 GSa/s ADCs and two 14 Mpts memory modules. When all four channels are enabled, each channel has a sample rate of 500 MSa/s and a standard record length of 7 Mpts. When only a single channel per ADC is active, the maximum sample rate is 1 GSa/s and the maximum record length is 14 Mpts. For ease -of -use, the most commonly used functions can be quickly accessed with its user- friendly front panel design. In addition, the four channel series includes even more functions, including: searching and navigating, on-screen Bode plot, 16 digital channels (Option), an external USB powered 25 MHz AWG module (Option), a USB WIFI adapter (Option), and an embedded application that allows remote control via web browser. A powerful serial bus trigger and decode feature comes standard on all SDS1000X-E oscilloscopes. The DesignCon show provided a great opportunity to meet with professionals and consultants from around the world and discuss the latest in test technology, such as DDR4, USB 3.1, PAM4 and their solutions.